Welcome to a whole new realm of digital signal processing! The Ibanez SDR 1000 Stereo Digital Reverb (Based on Sony MU-R201) re-defines digitally-simulated reverberation with true stereo operation, 16-bit digital processing for crystal-clear reverberation, and factory preset programs developed by professional studio engineers, especially for the Ibanez SDR 1000. This is the Sony MU-R201 that the Ibanez is under the skin. The results are room, hall and plate simulations of unusual naturalness and clarity. The Ibanez SDR 1000 also provides “gated” and ”reverse” reverb effects, as well as dual multi-tap delay (echo) processing. The Ibanez SDR 1000 is truly a digital processor for everyone. The Ibanez SDR 1000 incorporates many design break throughs, in both hardware and software, that combine to make it the unique processor that it is. The following list high-lights the major features that you should be aware of. 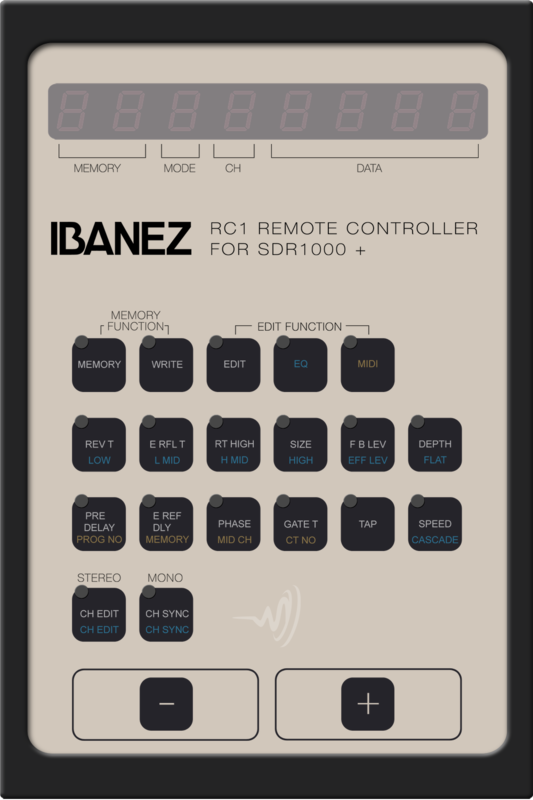 The Ibanez SDR 1000 provides, for the first time, TWO independently programmable channels. You can now set up two totally different reverb sounds (in the “Dual Reverb” Mode 7) or two arrays of delay taps (in the “Dual Delay” Mode 5), and use them simultaneously! True stereo reverberation is possible with advanced, high-speed parallel digital processing. The two channels of the Ibanez SDR 1000 may be easily programmed for identical processing characteristics. The custom-design DSP (Digital Signal Processor) is a high-speed, full 16-bit LSI (Large Scale Integration) chip. This provides professional-sounding reverb effects with very low distortion and low quantization (digital-error) noise. The Ibanez SDR 1000 provides a powerful, user-oriented programming capability. Eight “modes” create eight distinct “sound fields”, including hall, room, plate, gated and reverse reverb effects, and dual, multi-tap delay effects. The Ibanez SDR 1000 comes factory-programmed with 30 preset sounds. These sounds have been created by some of the hottest recording producers in the industry, so they represent the most popular reverb and delay sounds available. Each mode has user-programmable parameters (including programmable four-band E0!) for an unusually wide range of possible reverb and delay sounds. Seventy user-programmable preset locations give you plenty of space to be creative! Advanced user-friendly software makes program copying and editing a snap. You can also compare your new sound with the sound in memory, with the touch of a single key! Extensive MIDI flexibility lets you program the SDR 1000 to fit into any MIDI system. Select any program within the SDR 1000 with your MIDI controller. The SDR 1000 also lets you select programs with the front panel keypad, or remotely with momentary footswitches or with the Ibanez FC60 intelligent Foot Controller. Select your programs in live situations from any stage location. The SDR 1000 provides an eight-digit fluorescent display and LED-keys that prompt you for easy preset programming and recall. Phone jack and RCA-type pin jack inputs and outputs make the SDR 1000 easy to use in any live, studio or home recording application. Versatile input level ranging and output signal mixing make it easy to “optimize” the SDR 1000’s performance in any application.